Oscar-winning production designer Dennis Gassner gives us a brief description of design to completion in the latest Skyfall videoblog from 007.com. But he’s careful about not offering any clues about the characteristic look. 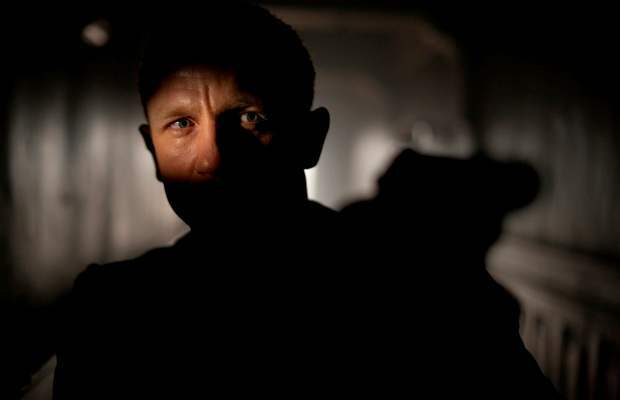 However, in Quantum of Solace, he took inspiration from Ken Adam and figured out a pattern language based on Daniel Craig’s blue eyes and “angular, chiseled, textured face.” From the look of the locations and sets, it appears that he’s expanded into a striking mash-up of ultra-modern and retro. For instance, M’s office is more open and classical in appearance. The site of the Istanbul Skyfall press conference Sunday conjured up images of From Russia with Love. Mendes reaffirmed that he wishes to convey both the classicism and modernity of the iconic city in keeping with the tone of the 23rd Bond film. This marks the third time for Turkey in Bond (the second was The World Is Not Enough). At the same time, Mendes promised a more playful, humorous Bond while Craig reiterated a preference for dark, gallows humor. 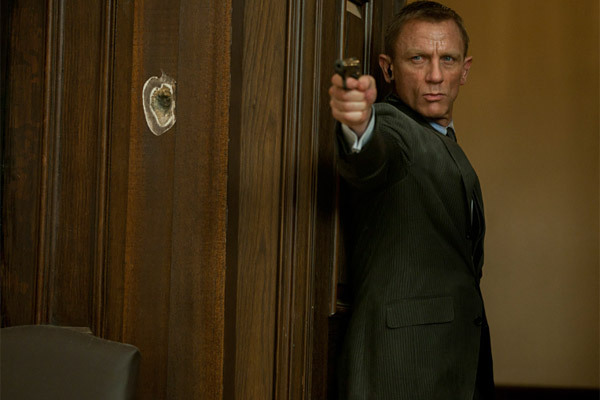 His Bond certainly is not in a comfort zone and is pushed to extremes both physically and emotionally, as the personal histories of Bond and M are explored for the first time. The trailer is mainly comprised of Bond being interrogated in a word association game over establishing shots of London, then a target at a shooting range, and then the interrogation room itself: Country/England…Gun/Shot…Agent/Provocateur…Murder/Employment. 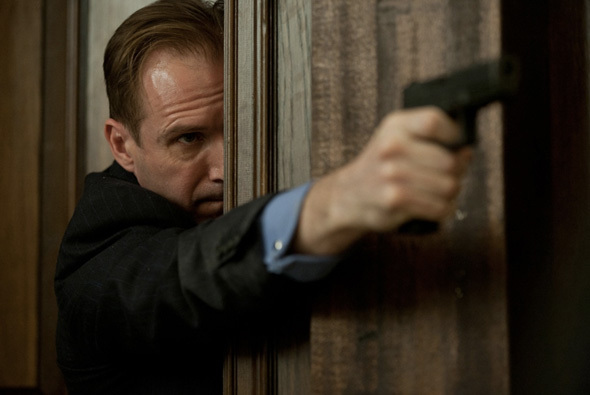 It turns out that Bond is being observed by M and Ralph Fiennes’ Mallory (a high-ranking MI6 official), among others, through two-way mirrors. 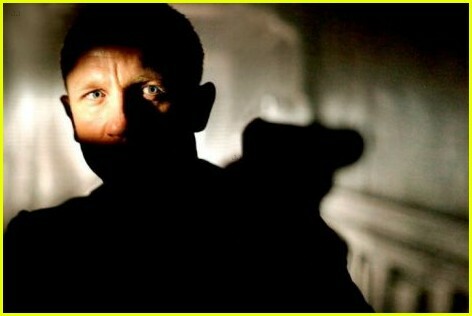 When the mysterious interrogator says, “Skyfall” and repeats it a second time, Bond says, “Done,” and walks out. He must’ve hit a personal nerve. Mendes also confirms that Skyfall will be more playful, comparing it to Goldfinger, From Russia with Love, and Live and Let Die. Meanwhile, producer Michael Wilson says Skyfall “is about Bond defending MI6, the country, and the realm” from Javier Bardem’s terrorist, Silva, who’s more nuanced and nimble than the usual baddie. I’ll have a lot more to report after seeing the trailer the week of May 25th (screening with Men in Black 3). The latest Skyfall videoblog from 007.com focuses on the exotic second unit work in Shanghai with comments from second unit director Alexander Witt, first assistant director Michael Lerman,and production manager Angus More Gordon. 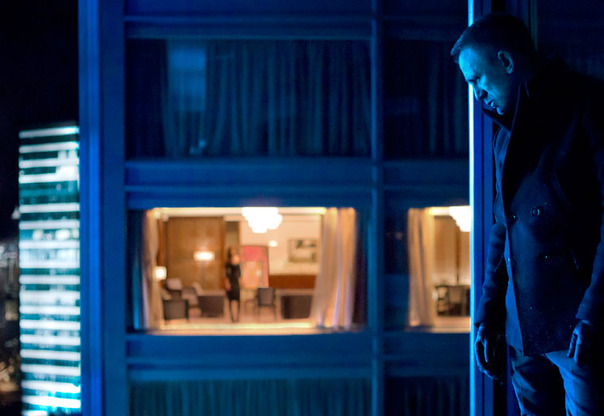 Of particular interest are the blue neon-lit highways and skyscrapers, which provide an ultra-modern vibe to the action-centric drama helmed by Sam Mendes and digitally shot with Arri Alexa by Roger Deakins. Meanwhile, Activision announced the autumn release of the 007 Legends video game on PS3 and Xbox 360, which ties together six classic plot lines (including Skyfall) in honor of the 50th anniversary. Touts new maps, weapons, and characters and a multi-player experience. 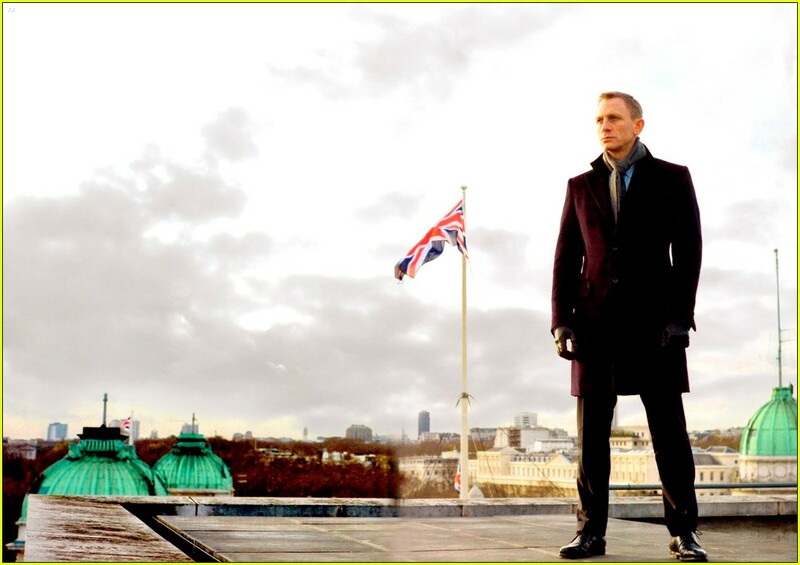 Coinciding with recent Skyfall set visits at London’s legendary Pinewood, we have a slew of new images from the 23rd James Bond film. Thanks to Comingsoon, Hitflix, Just Jared, and Dark Horizons. 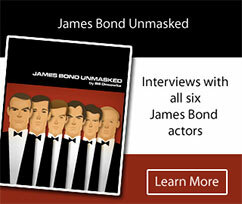 Also, 007.com offered a video of onset interviews with Daniel Craig, Javier Bardem, and Bérénice Marlohe. 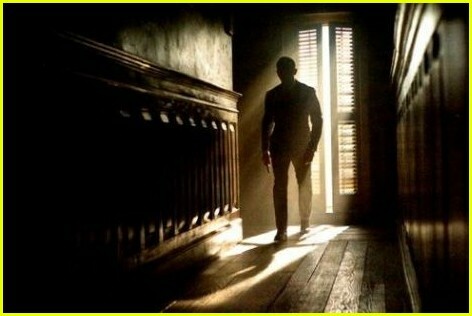 Meanwhile, the Daily Mail reports that teaser trailer is due May 25th with Men in Black III. With photographers infiltrating top secret locales in London, Scotland, Surrey, and Turkey, 007.com has released videoblogs about the two Bond girls of Skyfall: Bérénice Marlohe, who plays mysterious and seductive baddie Sévérine, and Naomie Harris, who portrays rough-and-tumble MI6 field agent Eve. Amid press conference footage, photo sessions, and a shot descending an escalator, Marlohe reveals that she’s drawn to the duality that defines the Bond girl, while Harris explains during weapons training footage that her character is no nominal colleague. She appears to be a far cry from Moneypenny or perhaps will evolve into a new incarnation. 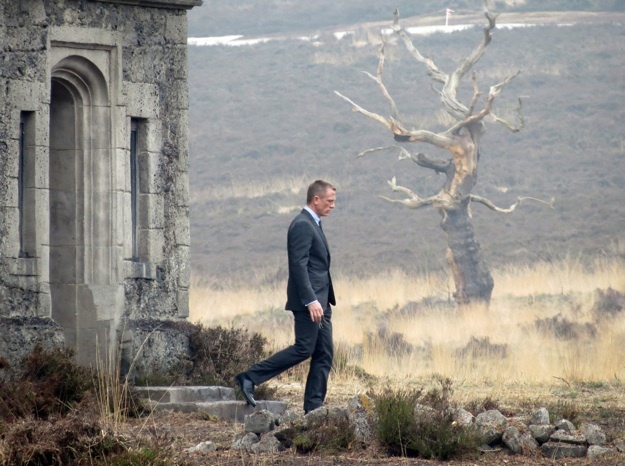 Along with taking us deeper into M’s back story, Skyfall will apparently take us back to Bond’s Scottish roots for the first time as their stories converge, according to a Surrey-based nature photographer/blogger. There are spoiler details on the site. Another photographer, Simon Bridger of Flynet Pictures.com, has snapped other images of the exterior buildings constructed in Surrey (see above), which match the Glencoe footage shot earlier. Thanks to MI6 for providing further info. 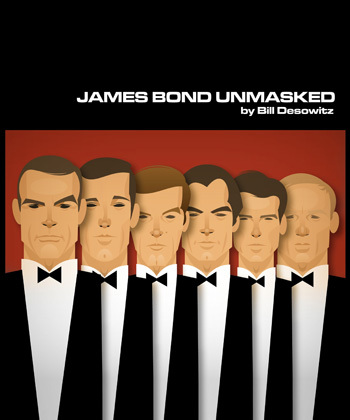 An interest in Bond genealogy is definitely required if you wish to delve further into this. 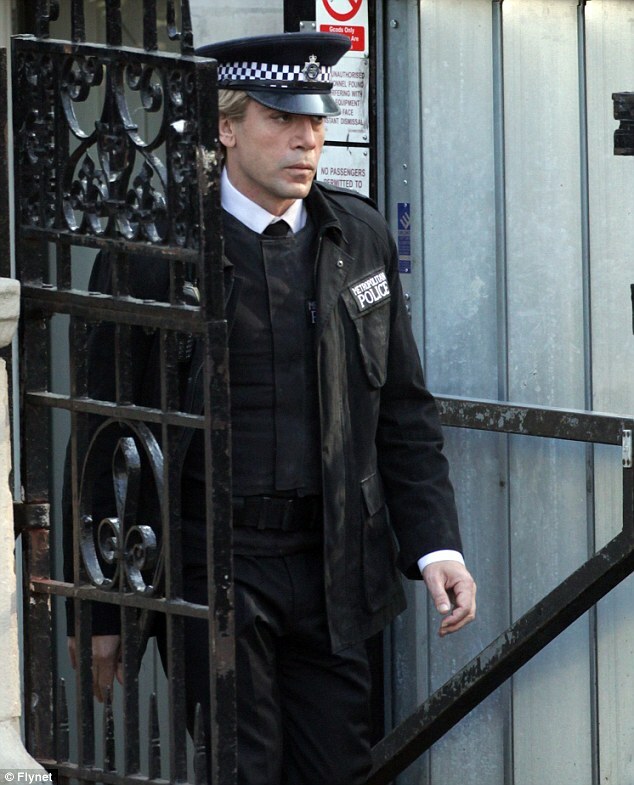 The Daily Mail caught the first glimpse of Javier Bardem as the latest Bond baddie, Silva, on the set of Skyfall in London’s Whitehall district, dressed inconspicuously as a blond police officer (recalling Red Grant and Max Zorin). 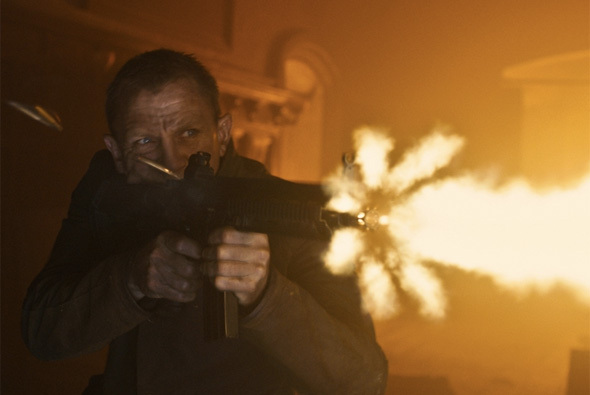 In a continuation of a sequence shot last month, Daniel Craig’s James Bond runs through the vicinity with an ear piece after an underground explosion. Is Silva a master of disguise? 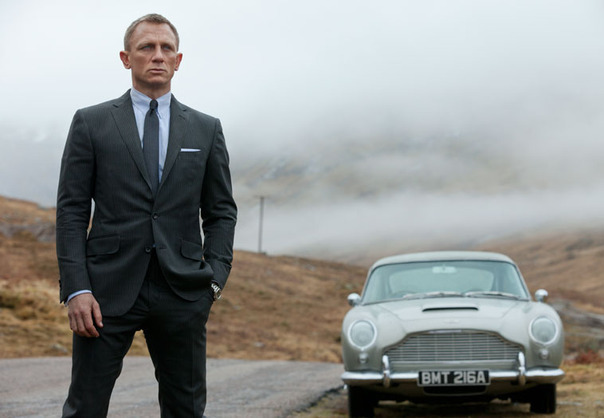 The IMAX’d 23rd Bond film opens Nov. 9 in North America after an Oct. 26 bow in the UK.